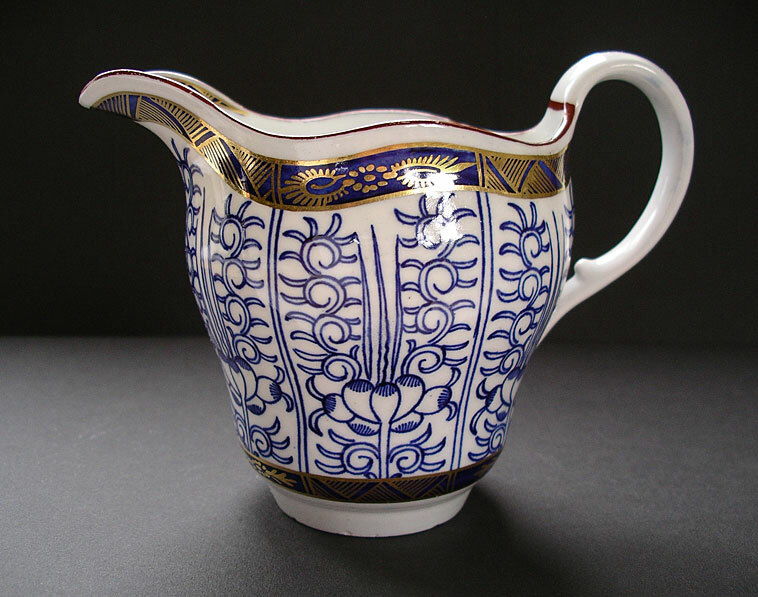 "An attractive First Period Worcester eighteenth century cream jug hand decorated with a delightful formalized Chinese style blue and white design. The pattern is known as Royal Lily BFS I.F.8. This early example dates from circa 1775 and is beautifully finished with a blue gilded border and rouge de fer edge line. 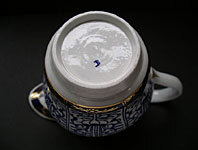 The Royal prefix originates from an order placed for a "Lily" pattern service by King George III in 1788. 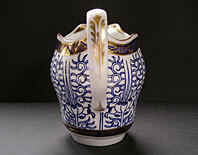 A great example of this pattern, found on a rare and exquisite Worcester porcelain cream jug." Antiques Expert Hamilton Bear. 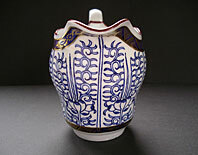 References: Branyan, French and Sanden, Worcester Blue and White Porcelain 1751-1790, page 297 illustrates a Royal Lily teapot stand in the Museum of Worcester Porcelain collection. Dimensions: width 135 mm max. height 105 mm max. Mark: marked with Worcester open crescent as illustrated. Condition: In excellent overall condition with no restoration. 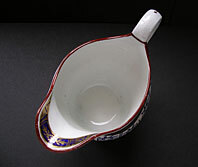 There is a tight faint hairline extending inside the jug from a firing crack near the top of the handle - as illustrated larger than life size.